North Koreans economic migrants or political refugees? China defends the repatriations of North Korean refugees back to North Korea by claiming that the refugees are simply “economic migrants”. Writes Suzanne Scholte of the U.S. Committee for Human Rights in North Korea, “Yet as soon as a North Korean crosses the border, they immediately fit the definition of a political asylum seeker because it is a crime against the state for a North Korean to leave the country. Ri was shown smiling while speaking with her husband, her arm tucked closely under Kim’s as they led an entourage of senior military and party officials through the park. It appeared to be a carefully choreographed appearance aimed at showing Kim Jong Un as a friendly, modern leader, no different from the heads of other countries. It also provided a sharp contrast to the intensely private face his father Kim Jong Il had portrayed during his 17 years in power. Such public displays of affection aren’t unusual among ordinary North Koreans, but they are a big change for the ruling family and a “shocking” development in a country like North Korea, where first ladies are normally hidden from publicity, said Lee Woo-young, a professor at Seoul’s University of North Korean Studies. 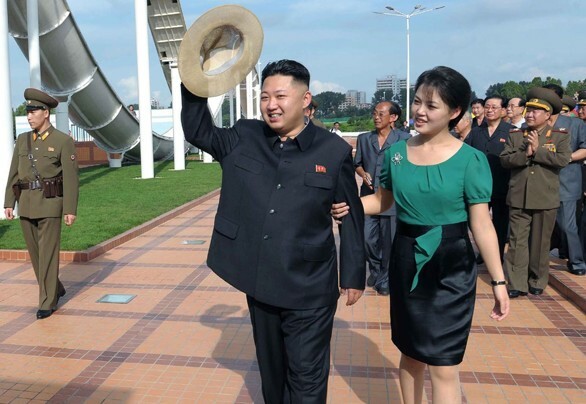 South Korean media reports said Ri Sol Ju is a former popular singer and …. that they married in 2009! 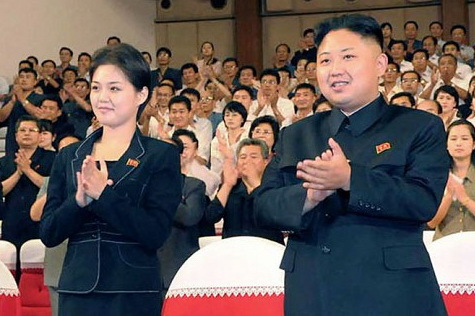 Other recently-published photos show Kim and and a stylish Ri smiling broadly at public events. In an upscale coffee shop, Choi Kyong-chol clutches his knapsack. All his worldly valuables are in the small black bag. A North Korean refugee – a farmer who escaped to Seoul – Mr. Choi is still a bit dazed by the big city. A year ago, Choi lived on a pig farm in north China with his family, also escapees from hunger in North Korea. But one day, Chinese police came to the family hut, handcuffed the five Chois, and sent them home. On March 14, 2002 Choi and 24 other North Koreans rushed into the Spanish Embassy in Beijing, as TV cameras rolled. That dash marked the first sight, for much of the world, of a special problem – runaways from the world’s last Stalinist regime – that until recently had not even been identified. Since the mid-1990s, North Korean runaways have been voiceless and largely powerless pawns in a geopolitical conundrum: China doesn’t especially want them, and the North will punish them if they return. They live in a silent daily struggle along China’s border, where crossing a small river is a ticket to a new world, albeit one where they might be arrested. Since the Spanish Embassy event, the policing of illegal Koreans in China has intensified. Along the border, China has heightened a two-year crackdown – with stepped-up house-to-house searches, leaflets warning villagers not to help, and bounties paid to informants, according to seven recent escapees interviewed for this report. According to Tim Peters, an aid worker in Seoul, some Chinese make up to 2,500 yuan ($400), to identify any of the missionaries who troll the border. Before he could go, Choi got word that his father was impatient and wanted to leave North Korea. To this day, he hasn’t seen them. Eventually Choi met a railroad worker in China. Choi will say nothing about these contacts, other than that they took place through someone who knew his father. Until Choi got to Beijing, he says, he didn’t really understand the plan, did not realize that Norbert Vollertsen, part of an international group of nongovernmental organizations (NGOs), had cased the German Embassy the night before and found the security too tight. Not until the Koreans rushed the Spanish Embassy, their alternate plan, did Choi grasp what he was part of. Why do North Koreans flee North Korea? Lee’s crime was that she was hungry. After years of meager rations in North Korea, the 22-year-old woman with curly hair left her peasant family’s home and slipped across the border into China, hoping to find something to eat. She was caught and sent back, handcuffed, to a North Korean prison camp — a world of cruelty. She was worked to exhaustion, forced to run in her bare feet as she carried heavy bricks at a construction site. Her food was a bowl of watery soup every day with cabbage and a few rotten corn kernels. The U.N. Commission on Human Rights condemned North Korea’s human rights record, answering years of demands by activists that the world confront the abuses. The commission expressed “deep concern” about conditions in the country, including torture, public executions, political executions, use of political prison camps and selective provision of food. The vote is a response in part to the harsher tone adopted by the Bush administration in dealing with North Korean abuses. Previously, the United States and other countries had been reluctant to push the human rights issue with the prickly North Korean government, arguing that it would have little effect. But to the dismay of activists, South Korea and its new president, Roh Moo Hyun, a human rights lawyer, abstained from voting. “South Korea should be ashamed that foreign countries are saying what we are afraid to say on behalf of fellow Koreans,” said Chun Ki Won, a South Korean Christian aid worker who has been jailed in China for his work helping North Koreans escape. Human rights activists estimate there are about 200,000 prisoners in at least five large North Korean camps, some confined for trying to escape like Lee, others for political offenses that make it likely they will die in prison. Rights activists were especially critical of South Korea’s position, saying they expected more from South Korea’s new government. Roh, in a recent interview with The Washington Post, defended his position. “Rather than confronting the Kim Jong Il regime over human rights of a small number of people, I think it is better for us to open up the regime through dialogue,” he said. “I think this will ultimately bring broader protection of human rights for North Korean people as a whole. Lee saw the horror of those human rights conditions during her imprisonment in North Korea. The young woman cannot give her full name; her mother and three siblings still in North Korea would be in grave danger. Sitting in an activist’s office in Seoul, her pretty smile dissolves into tears at recalling her months in prison. Each night, she said, the 160 women in the camp lined up, heads bowed, as a guard whipped those who had not worked hard enough and slammed the heads of others against the wall. Fifty women were packed into a tiny room, forced to sleep while sitting. “You go to sleep, and the next morning the person next to you is cold, dead,” she said. “The older women would die right away.” She said that a fellow prisoner, desperate with hunger, bit off half the ear of a woman who had died, and put it in her pocket to eat later. Two sisters who tried to escape were caught and brought back to the camp to serve as a lesson. Lee said they were forced to lift a heavy log until it fell, crushing them. Other prisoners were ordered to stomp on the sisters’ hands to break their bones. Finally the two women were strapped to a wall to be starved to death. “After a week their bodies were gone. They had died,” said Lee. Lee became so weak in the camp she was sent home to die. Instead, a trader carried her on his back across the river to China, where she recovered her strength. A Christian activist gave her false papers, and Lee lived illegally for four years in eastern China, despite regular roundups by Chinese authorities to force North Koreans back across the border. She finally joined the long smuggling route, an “underground railway” for North Koreans, that took her to Mongolia and eventually to South Korea. Only when she was safe did she throw away the rat poison she planned to take if she was forced back to North Korea again. Lee arrived in Seoul to find physical comfort, but also referred to the loneliness that many other defectors describe when they finally reach safety. After two months in South Korea’s reeducation camp, the government gave her an apartment and a monthly stipend. She is trying to learn secretarial skills and is contemplating life in a society where her accent and communist education set her apart. “I thought when I came to South Korea everything would be happy. But I realize that’s not true. I didn’t know where to go or how to behave,” she said. She is sending money back through the smugglers’ route so her mother and siblings can buy food in North Korea. “If my family is hurt, all my hope would be gone,” she said.